There are times when I dread posting. Today is one of them. Yet there is a much bigger story at work here and the goal is to write a compelling emotional story. I hope I am doing so. I also know and have known that there are elements in a story that are crucial to its growth but not very popular. I’ve struggled with that, yet I see the big picture and look forward to its growth. Thank you for your incredible support. On a side note, I am added the next 40 pages to the story in the next day or so…. ok I am queing them up. I have a long ways to go before I am done with this. Also I will be commenting later on this….. we really need to have a forum area to voice some opinions about what is going on? what do you think? $15 gets you a copy of the book and FREE Shipping, plus your name printed in the book as well. So if you want a copy before they become a available to the public in Nov and your name in the book… just put in a pledge. Everything is appreciated. We have 8 days left before everything goes through and I could not have done this without you. Thanks- Click here to pledge! Darn you enter key! 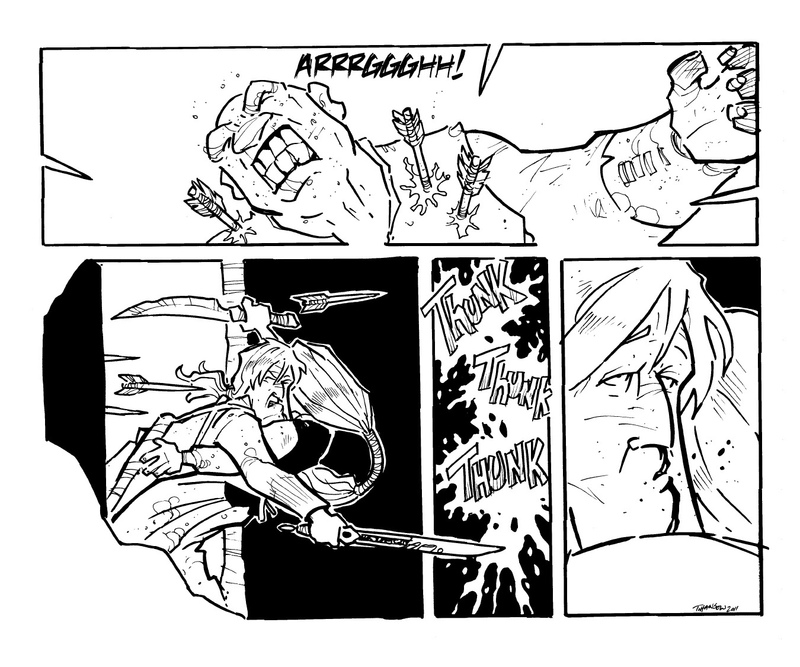 >_> What I meant to say was: "And after this, the entire webcomic shifts its focus to Ravna and her revenge." I do believe she is quite capable of kicking some no-good goblin tailend. To quote something really "en vogue" nowadays : Noooooooooooooooooo !!!!!! Eep, cliffhanger! Gort’s wounds don’t look immediately fatal, though there are bound to be more from where those came from. And Siv… Would Ravna run if Siv is wounded? Maybe, I think, but perhaps not soon enough. And where is Groggle? What happened to Mama? And what IS Mama? And, and… That emotionally compelling thing you mentioned? Yeah, you’ve got it. A forum would be cool, or at least I know I’d check it out & participate in a community that formed there. Also cool would be an RPG based on this world, though there is a danger in codifying everything. "Siv…. if you die, I'm going to kill you." Ah, was Siv wearing armor? Did Ravna get some broken ribs? How badly did Gort take this interference?? I wouldn't count Siv out yet. Gort… Gort is just gonna be really ticked off. Trav – you succeeded at the "compelling emotional" part, at least with regard to me. This page… I mean I legitimately went through all the traditional steps of grieving (denial, anger, bargaining, depression, acceptance) in about a 10 minute span. I didn't even realize how much hope I'd developed for Siv and Ravna until I got to the end of this page. Masterfully done, sir. Thanks for sharing this story with us – it's an amazing one worth the telling. Ouch! The big ogre looks like he's just going to be MUCH more angry, but the situation might not be so rosey for Siv protecting the girl. The sound you wouldn't want to hear is an arrow in the back of your head.